Enhanced poly construction that is highly durable and glides easily on the mat during grappling. These MMA shorts are constructed for maximum flexibility and quality to provide you with the edge during your match. The waistband features reinforced seams with a velcro closure which will not be uncomfortable or prone to loosening. 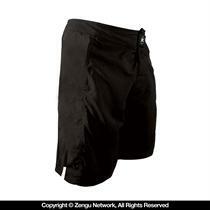 In addition to their usefulness in the cage, these shorts can be used for swimming and the beach (bonus!). Email your friend about the Spartan MMA Shorts. Ask a question about the Spartan MMA Shorts.